Numerous studies of human populations in Europe and Asia have revealed a concordance between their extant genetic structure and the prevailing regional pattern of geography and language. For native South Americans, however, such evidence has been lacking so far. Therefore, we examined the relationship between Y-chromosomal genotype on the one hand, and male geographic origin and linguistic affiliation on the other, in the largest study of South American natives to date in terms of sampled individuals and populations. A total of 1,011 individuals, representing 50 tribal populations from 81 settlements, were genotyped for up to 17 short tandem repeat (STR) markers and 16 single nucleotide polymorphisms (Y-SNPs), the latter resolving phylogenetic lineages Q and C. Virtually no structure became apparent for the extant Y-chromosomal genetic variation of South American males that could sensibly be related to their inter-tribal geographic and linguistic relationships. This continent-wide decoupling is consistent with a rapid peopling of the continent followed by long periods of isolation in small groups. 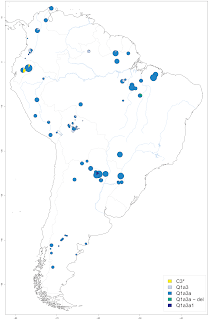 Furthermore, for the first time, we identified a distinct geographical cluster of Y-SNP lineages C-M217 (C3*) in South America. Such haplotypes are virtually absent from North and Central America, but occur at high frequency in Asia. Together with the locally confined Y-STR autocorrelation observed in our study as a whole, the available data therefore suggest a late introduction of C3* into South America no more than 6,000 years ago, perhaps via coastal or trans-Pacific routes. Extensive simulations revealed that the observed lack of haplogroup C3* among extant North and Central American natives is only compatible with low levels of migration between the ancestor populations of C3* carriers and non-carriers. In summary, our data highlight the fact that a pronounced correlation between genetic and geographic/cultural structure can only be expected under very specific conditions, most of which are likely not to have been met by the ancestors of native South Americans. In the largest population genetic study of South Americans to date, we analyzed the Y-chromosomal makeup of more than 1,000 male natives. We found that the male-specific genetic variation of Native Americans lacks any clear structure that could sensibly be related to their geographic and/or linguistic relationships. This finding is consistent with a rapid initial peopling of South America, followed by long periods of isolation in small tribal groups. The observed continent-wide decoupling of geography, spoken language, and genetics contrasts strikingly with previous reports of such correlation from many parts of Europe and Asia. Moreover, we identified a cluster of Native American founding lineages of Y chromosomes, called C-M217 (C3*), within a restricted area of Ecuador in North-Western South America. The same haplogroup occurs at high frequency in Central, East, and North East Asia, but is virtually absent from North (except Alaska) and Central America. Possible scenarios for the introduction of C-M217 (C3*) into Ecuador may thus include a coastal or trans-Pacific route, an idea also supported by occasional archeological evidence and the recent coalescence of the C3* haplotypes, estimated from our data to have occurred some 6,000 years ago. Citation: Roewer L, Nothnagel M, Gusmão L, Gomes V, González M, et al. (2013) Continent-Wide Decoupling of Y-Chromosomal Genetic Variation from Language and Geography in Native South Americans. PLoS Genet 9(4): e1003460.